1st December 2011. The annual Christmas Gift Guide edition of the ExplorOz Newsletter with gift ideas, great discounts and a summer special offer from Waeco. Can you believe it? December is already here and Christmas is fast approaching. If you haven't started your gift shopping, or are stuck for ideas for anyone on your list, we've put together our annual Christmas gift guide. With a massive range of travel and lifestyle products on offer, you're sure to find great gifts for your family and friends in the ExplorOz Online Shop, and to help you get started we've put together some of our top present ideas. Plus, you can now enter different delivery and invoice details into the checkout making gift purchasing even easier! Off-road GPS units are the ultimate gift for any traveller and ExplorOz has a range of GPS units and packages that offer fanatastic value for money. The Hema Navigator HN5i is now available for only $740 ($720 for Members) as well as in State-based Topo packages for $790 ($770 for members) which include up to $300 of additional mapping. The VMS Touring 700 HD On and Off Road is just $699 ($664.05 for members), and is also available with reversing camera kits where you can save up to $150 off the standard RRP! An alternative option for the technically minded are our GPS and Digital Map Starter Packs, these are a self set-up customised navigation solution for anyone with a netbook. Our suggestions for gifts for the avid camper include Camping Around Australia, CampsSnaps Australia Wide 6 Mega B4 - Spiral Bound, or any of the titles in the state-based Boiling Billy Camping Guide range. Not only do we stock a huge range of camping guides, see our Outdoor Gear for further great gift ideas. So you know they have a 4WD and love to get out and use it - but what do you buy them? The shop's 4WD Guides & Magazines have been specially selected to include titles suitable for all experience levels, so you'll find a title suitable for any 4WDriver no matter what their vehicle or travel plans are. 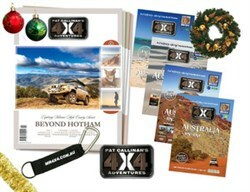 Our top picks for 4WDrivers: 4WD Australia, 4WD Handbook and The Complete 4WD Guide. Plus, our Vehicle Gear section is the place to go for any accessories they may need, with products ranging from the Super Mini Booster to ExplorOz Spare Wheel Rubbish Bags. Due to high demand, Dometic Waeco has extended their Spring offer to run over Summer! The Bring on Summer Offer provides great value with the purchase of a WAECO CoolFreeze CF-50 or CF-80. The CoolFreeze range is designed for Australian conditions, delivering high performance cooling or freezing even in blistering heat, and keeping its cool even in areas with high fluctuating temperatures. Purchase a WAECO CoolFreeze CF-50AC VERB or CF-80AC VERB fridge/freezer and you will receive a FREE insulating protective cover and a WAECO Cool-Ice WCI-55 icebox. This means $388 RRP of added value with purchase of the CF-50 or $428 RRP of added value with a CF-80! Offer is available up to 29/2/12. Conditions apply – please visit website for details. To find your nearest Dometic-WAECO retailer visit www.dometic-waeco.com.au or Freecall on 1800 21 21 21. Subscribers of the ExplorOz newsletter received a promo code for a 10% discount in our newsletter last month. This promo code can be used until 18th December. If you haven't used yours yet, simply enter this code into your shopping cart on ExplorOz.com to get 10% off your purchase. Don’t know the code? Last month's newsletter can be viewed online along with all previous editions. Buy a gift that will keep them happy all year long! 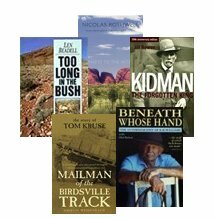 From the tales of Australia's explorers to contemporary travel experiences, you'll find it all in our new Australian Stories section.